As you may well have guessed..... my name is Karen Price. Its certainly no secret and I am happy to announce it to the world.... I LOVE DOGS. Here I am with Winston and Hugo, the 2 lights of my world. I've owned (or more accurately been owned by) giant breed dogs for more than 20 years. 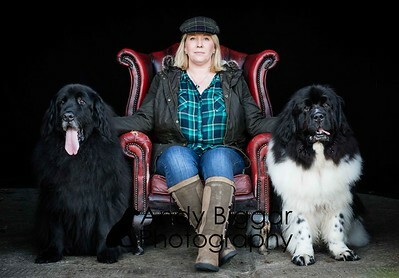 We initially started with Pyrenean Mountain Dogs for around 12 years and then changed over to Newfoundlands. I currently have Winston (9 years old) the black Newfie and Hugo (5 years old) the Landseer Newfie. Standard answers- yes they are that big, they weigh almost 10 stone each, yes they do drool a LOT, no they don't eat as much as you'd think, and they are complete couch potatoes! Last year I had the opportunity to spend time working on my photography including some courses and workshops, including a brilliant one specialising on dog photography. I then realised it made me really happy spending time with a variety of animals and their owners. This inspired me to set up my own business taking pictures and creating fantastic images to capture the character of your amazing pet (everyone's pet should be amazing to them!) and showing the bond with your beloved animals. I love meeting new clients and their animals and aim to make the sessions as fun as possible. Happy people and dogs make for better pictures!